Nick Lewis (standing far left) conducting 2016 Map Your Neighborhood Workshop. Photo courtesy of City of Mill Creek. Emergencies don’t often provide enough time to create and implement an action plan. 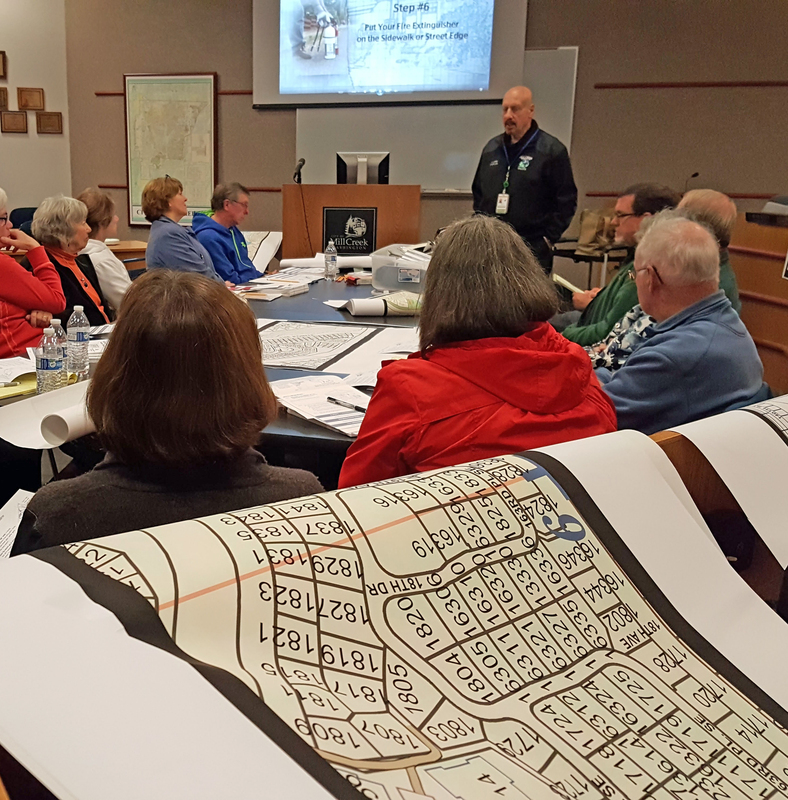 A free Map Your Neighborhood event at City Hall North in Mill Creek on Tuesday evening, February 19, 2019, will help people develop individual and neighborhood plans to be prepared for emergencies both large and small. “The past few snow storms are examples of when this type of information may be helpful,” said Mill Creek Police Deputy Chief Scott Eastman. The 90-minute Map Your Neighborhood workshop covers the first nine steps to take immediately following a disaster and teaches people how to work with their neighbors to identify safety hazards, including gas explosions, potential fires, water main shutoffs and other safety concerns. Neighborhoods that are prepared for emergencies and disaster situations can save lives, reduce the severity of injuries and trauma, and reduce property damage. Mill Creek Police Chaplain Nick Lewis, who leads the course and teaches the curriculum, hopes that participants take the information they have learned back to their neighbors and prepare themselves for any emergency, big and small. Most Map Your Neighborhood workshops are held at Mill Creek City Hall South Council Chambers, 15728 Main Street, on Tuesday evenings from 6:30 to 8:00 pm. The February 19th workshop will be held in Room 201 of Mill Creek City Hall North. The first 2019 workshop is scheduled on February 19th. Other workshops are scheduled for May 21st, August 20th, and November 27th. Interested parties should register in advance at www.cityofmillcreek.com/mapyourneighborhood. Mill Creek Police Chaplain Nick Lewis conducting 2016 Map Your Neighborhood workshop. Photo courtesy of City of Mill Creek.